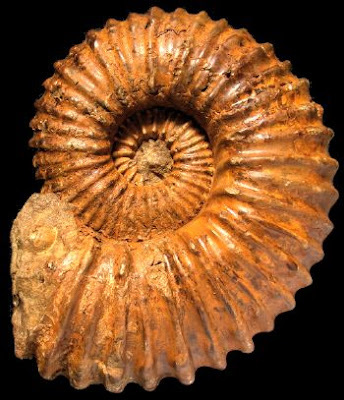 Calycoceras is a genus of evolute ammonites with depressed whorls known from the Upper Cretaceous (Cenomanian) (Wright et al. 1996). Characters (from Wright et al. 1996): Rather evolute, with whorl section depressed and subcircular, oval, polygonal, or subquadrate; ribs strong, generally straight, continuous over rounded or flat but not concave venter; on early whorls at least umbilical, ventrolateral, siphonal, and, in most specimens, midlateral tubercles; in multituberculate forms umbilical tubercle more prominent than midlateral; tubercles may disappear with age and may or may not be rejuvenated on last part of shell. Marked dimorphism in size apparently general. [KK08] Kennedy, W. J., & H. C. Klinger. 2008. Hypermorphosis in Salaziceras, a Cretaceous ammonite, from Madagascar. African Natural History 4: 113–116.